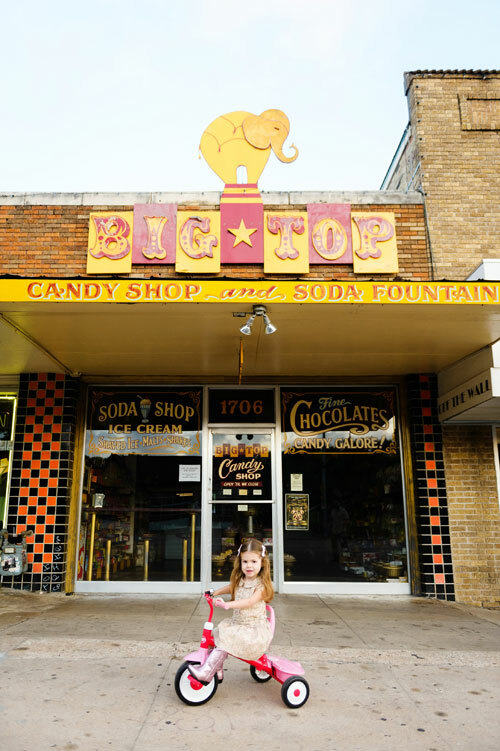 Step into this narrow slip of a store, seemingly miles long to children as their eyes pop at the ceiling-to-floor candy selections, and the phrase “like a kid in a candy shop” is taken to a whole new level. The choices of familiar treats, unheard of delectables, and sweets from decades past seem endless: huge lollipops, Payday bars, 5th Avenue, Oh Henry, candy by the piece, fine chocolates, chocolate covered insects, hard candy, salty candy, bulk candy, gummy anything you can imagine, truffles, licorice, bins of jelly beans, jaw breakers, bubblegum, and Wonka bars. They have it all, including an old-fashioned soda fountain where soda jerks whip up milkshakes, malts, and sodas. 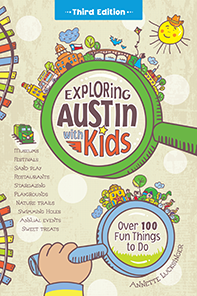 Curiosity and delight abound for children and adults alike as they wander the length of this circus-themed shop to peruse candy bins beneath brightly colored posters featuring acts like “Snake Boy” and “Voodoo Witch” alongside brass instruments and steampunk art. It’s a museum of goodness. Curbside along Congress Ave. and neighboring streets, or the parking garage behind Guerro’s Restaurant at Congress Ave. and Elizabeth St.